Photo courtesy of Palm Beach Dramaworks Panel members smile while discussion "Regional Theatre and the Development of New American Plays." At the far left is the panel's moderator, Bruce Linser. He is Palm Beach Dramaworks' Dramaworkshop manager. That is what National New Play Network Executive Director Nan Barnett told a Southeast Florida audience recently. 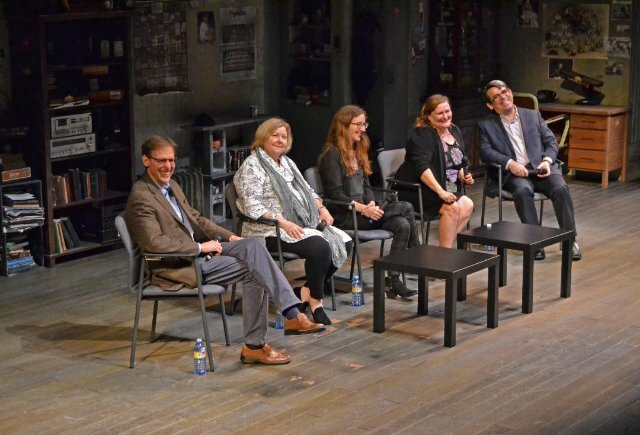 She comprised 1/4th of a panel which discussed “Regional Theatre and the Development of New American Plays.” The discussion was part of an inaugural weekend-long event at Palm Beach Dramaworks. Altogether, the professional, nonprofit West Palm Beach theater company’s first New Year/New Plays Festival featured five staged readings of new material. In addition, the event focused on the role regional theaters have in shepherding recently written plays from page to stage. Theater lovers might flock to New York City to see big-name actors perform in their favorite shows. However, fledgling writers may not have the chance to see their work produced there. Furthermore, there are “so many amazing theaters across the country doing vital work,” said panelist Haley Finn. She is the Minneapolis-based Playwrights’ Center’s associate artistic director. But even outside of New York, getting a play produced can pose a challenge. On average, it takes a writer seven years from the time he or she begins writing to see the work produced, Finn said. One theater company that has made developing new work part of its mission is Palm Beach Dramaworks. Producing Artistic Director and panelist William Hayes said that in the last five years, he has “amped up” his commitment to producing recently penned plays. Specifically, Hayes said from now on, he will try to stage at least one world premiere production every season. Recently, the company mounted an inaugural production of Lyle Kessler’s newest effort. It’s a dark dramedy titled House on Fire. The metaphor-rich, magical realism-infused play, which received largely positive reviews, centers on a dysfunctional family. House on Fire marked the second play that Palm Beach Dramaworks mounted on its mainstage from the company’s Dramaworkshop program. It is one that solicits and develops new works. The first such play was last season’s comic fantasia Edgar & Emily by Joseph McDonough. It focuses on an encounter between the poetess Emily Dickinson and horror writer Edgar Allen Poe, complete with Poe’s coffin. Meanwhile, the Dramaworkshop, which is alive and well, has existed since 2014. It receives play submissions each season from local playwrights and those nationwide. For the inaugural New Year/New Plays festival, Linser, an actor, director, musician and theater educator, moderated the panel about new work. Linser asked panelists why it’s important to bring new work to the stage. For one thing, people desire it, Finn responded. And that’s true not just for live theater. People also want to see the newest movies. Meanwhile, folks who shop at, say, Barnes & Noble “pick up classics,” but they also wish to discover the newest books, Finn added. Of course, “all the classics started somewhere, right?” Hayes offered. Moreover, “every play is new to someone the first time they see it,” Barnett opined. Who knows, the next big title might emerge from an alliance such as the National New Play Network. It’s an alliance of more than 120 professional theaters. They “share a dedication to the development, production and continued life of new plays and the pioneering of programs and innovations for the new play sector,” according to a description in the festival’s program. The network’s flagship initiative is the “rolling world premiere.” It supports three or more theaters choosing to mount the same new play within a 12-month period. This allows a playwright to develop a new work with multiple creative teams in more than one community. The playwright partakes in the process by making edits based on what he or she gleans from each mounting. The result of the program is a “stronger work overall and the momentum needed for a play to join the repertoire of frequently produced new American works,” according to the website. It adds that the National New Play Network has “championed the (Rolling World Premieres) of 75 new plays with over one million dollars in financial support. Rolling World Premiere alumni plays have received numerous citations. They include nominations for the Pulitzer Prize. Meanwhile, the National New Play Network allows people to search for and download new works through the New Play Exchange. Barnett said it comprises roughly 23,000 new plays and it’s a “highly searchable database.” Membership levels exist. For details, visit nnpn.org. Yet another organization supporting emerging work, specifically playwrights, is the Playwrights’ Center in Minneapolis. “It’s a wonderful way for writers to get to learn about their plays,” Finn said. She added that the organization allows playwrights to get a sense of how audience members respond to their work. Then, a playwright gets a chance to rework his or her play and, once again, present it to an audience. The center works not only with award-winning writers, but also those who “may not have access to professionals in their communities.” Finn explained. More information is available at pwcenter.org. In addition to Hayes, another local panelist was Susan Westfall. She is a “long-time advocate for playwrights,” according to the program. Among other positions she holds, Westfall is the Florida representative for the Dramatists Guild. She was quick to note that the guild is not a union, but a group of playwrights. “The guild has so much of an effect on playwrights, serving them in a protective way,” she said. For instance, its services include help with contract issues and general business support, Westfall added. Also, Different levels of membership exist. “The access is really wonderful,” Finn said. While playwrights might receive invaluable advice from such organizations and theater directors, audience members play a major role in theatrical productions. That’s particularly true when it comes to just- or newly-written plays and musicals. Audience members witnessing staged readings are no longer just audiences. They are also artists providing important feedback to playwrights, Barnett said. For instance, William Francis Hoffman's play, Drift, received a staged reading on Friday, Jan. 4, the festival's first day. "I know a lot more about the play than I did last week, (even) last night," he said. In fact, Hoffman said over a two-day period, he made changes on every page. Barnett stressed the role audiences play in new work development. “You are changing the face of American theater by being here today,” she told the panel’s audience.